Note: We will majorly introduce the Windows version of iMyFone TunesMate. If there is no special remark, the Mac version will be with the same capacities. In the meantime, you can complete the errands on Mac version by following the steps cited for the Windows version as well. For the Windows version or Mac version, iMyFone TunesMate has 6 function modules where you can use from the main interface. Without any device connected, iMyFone TunesMate will remind you to connect your device to computer with a USB cable on the Home interface. When your device is connected, the Home interface will show you three 1-Click functions which allow you to transfer in one click and 1 Details option that you can learn more about the detailed info of your device. The three 1-click functions are "Transfer iDevice Media to iTunes", "Transfer iTunes Media to iDevice" and "Backup Photos to PC/Mac". 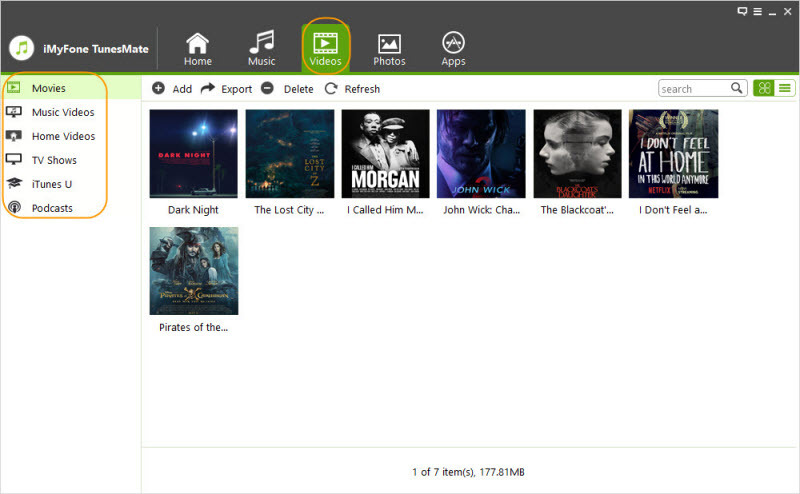 It involves all the audio contents in your device by sort, like, Music, iTunes U, Podcasts, and Audiobooks. Then, all your music playlists will be listed under "PLAYLISTS". 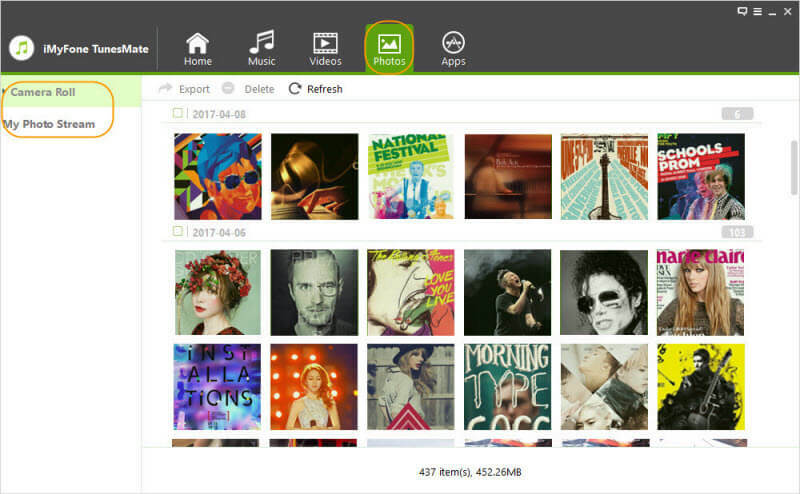 Through Music module, you're empowered to freely transfer and smartly manage your music collection on your iDevice and iTunes library. It involves all the video contents in your device by sort, such as Movies, Music videos, Home Videos, TV shows, iTunes U and Podcasts. You're empowered to transfer and manage your videos on your iDevice and iTunes library flexibly. It involves your photo contents in your iDevice by sort, such as Camera Roll and My Photo Stream. 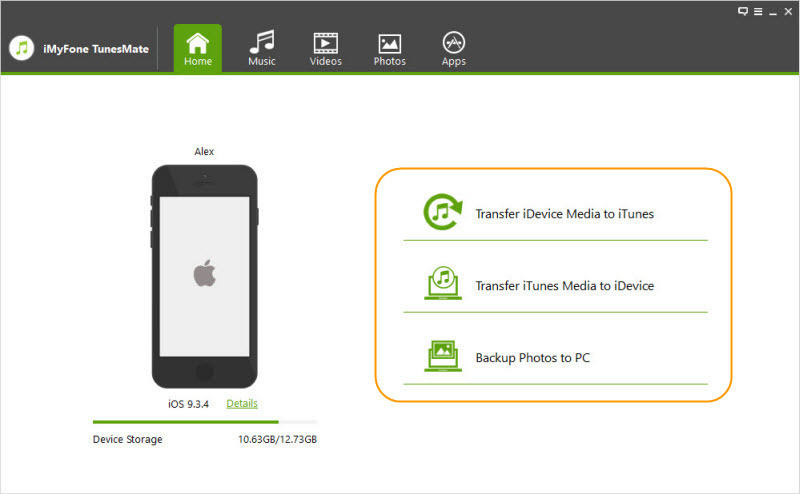 You’re empowered to transfer and delete your photos on your iDevice easily. 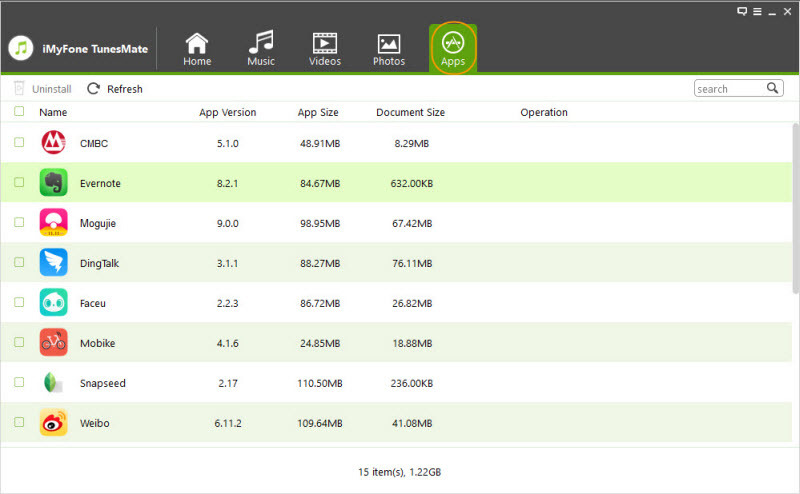 You’re empowered to uninstall apps on your iDevices in batch easily. You can register the license, find detailed info of the software, check for updates, send Feedback, search FAQ, etc. 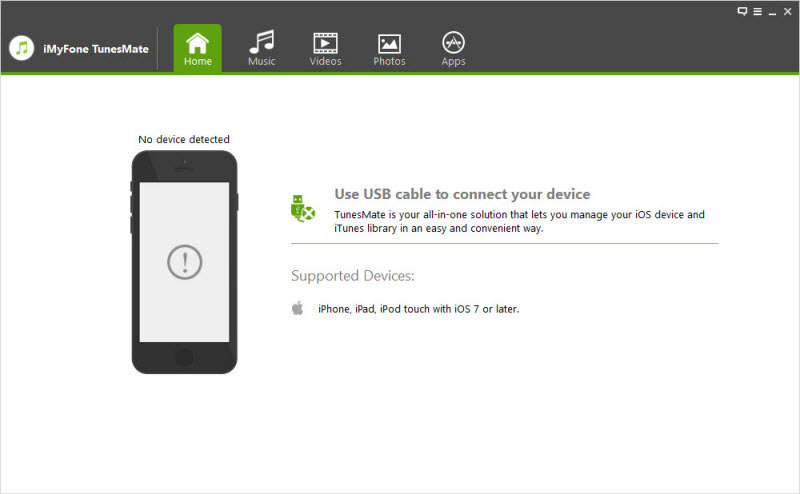 To enjoy iMyFone TunesMate, you need to connect your iDevice to computer with a USB cable. So as to make the process simple and easy, kindly, follow the following steps. Fully compatible with iOS 7, iOS 8, iOS 9 , iOS 10 & iOS 11. Support iPhone X, iPhone 8/8 Plus, iPhone 7/7 plus, iPhone 6s/6s plus, iPhone 6/6 plus, iPhone SE, iPhone5/5s/5c, iPad Pro, iPad Air, iPad mini, iPod touch and more. How to Connect Your iDevice with A USB Cable? Step 1: Install and launch iMyFone TunesMate on your computer. Connect your iDevice to your computer with a USB cable. 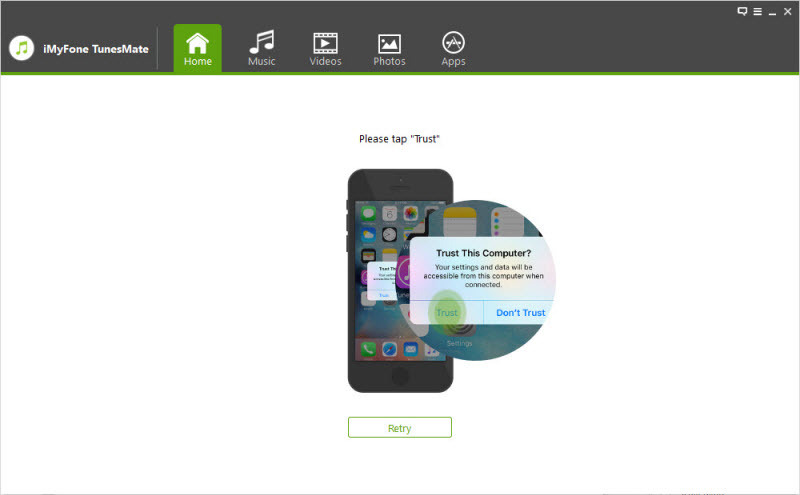 Step 2: iMyFone TunesMate will remind you to trust the computer on your device. Please unlock your device and tap "Trust" button from the pop-up window on your device. Once done, TunesMate will automatically detect your device. 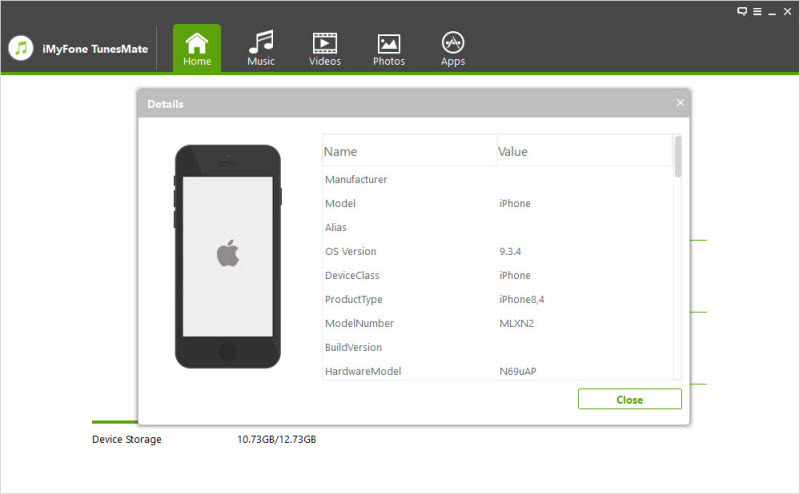 Note: You can click "Details" option under the device icon on TunesMate for more detailed info about your iDevice.